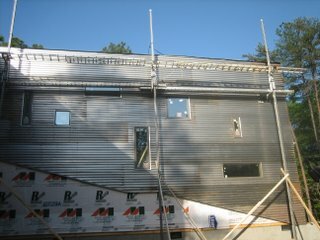 Here are some exterior and interior photos from the job site this morning of the modular house we're building in Chapel Hill. 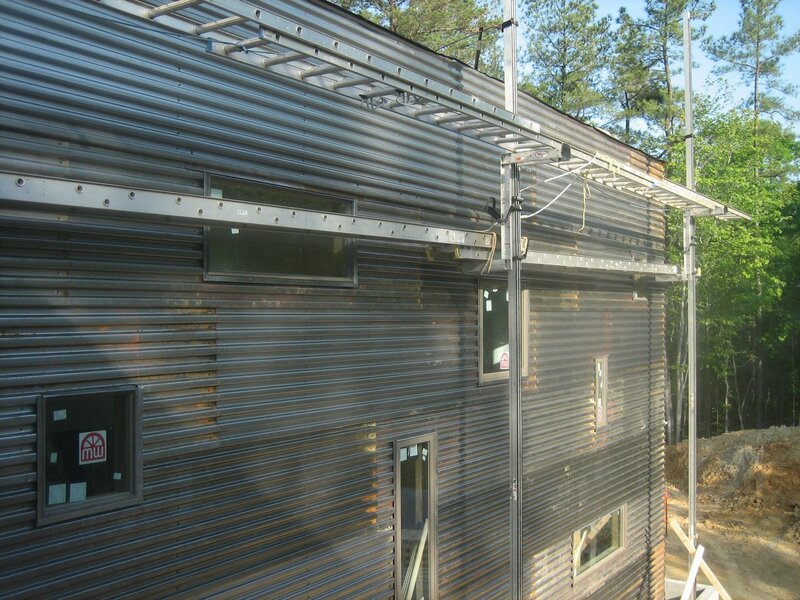 These images show the beginning of a very creative exterior siding plan that includes a variety of materials like metal, stone, concrete, and wood. 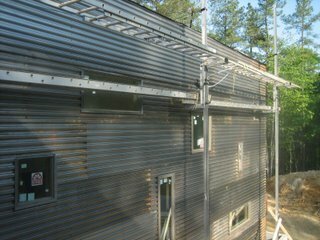 The photos also show the construction of the roof terrace above the garage...which includes storage on both sides of the roof terrace. 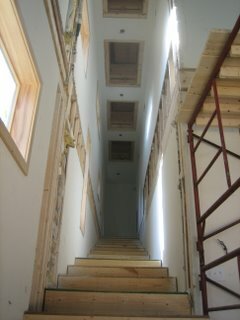 You'll also see a shot of the skylights above a staircase with long treads, window views, and places for art. 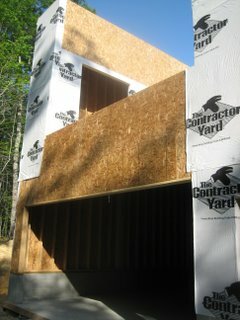 More info coming soon on the architect, Dustin Ehrlich, and his statement about the house. 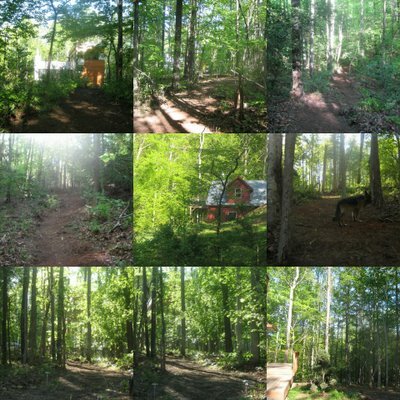 Back at Beech Hill, we're developing a solar lit trail system weaving through the 14 acre hilly, wooded property to connect dwellings and create some unique outdoor spaces along the trail. Back at Henley, all but one of the lots have been sold, so we've picked up our teak lot signs and will be re-using them for some upcoming projects. 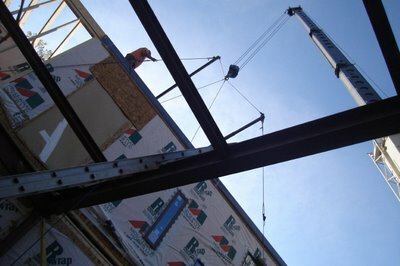 We've kept one sign at lot 17 where we're building a Greenbelt house. The topographical survey for riverfront lot 17 has been completed, the house orientation determined for passive solar gain, and the approximate footprint marked on the lot. More coming soon on this project. 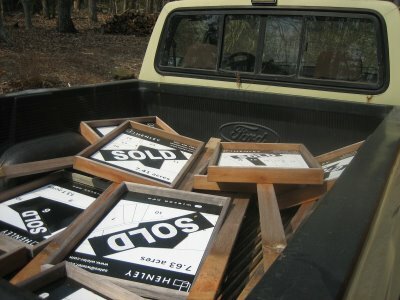 The rest of these signs (and more) may also end up at Henley North in 2008 on the Chapel Hill/Pittsboro line in northern Chatham county. More on that soon. 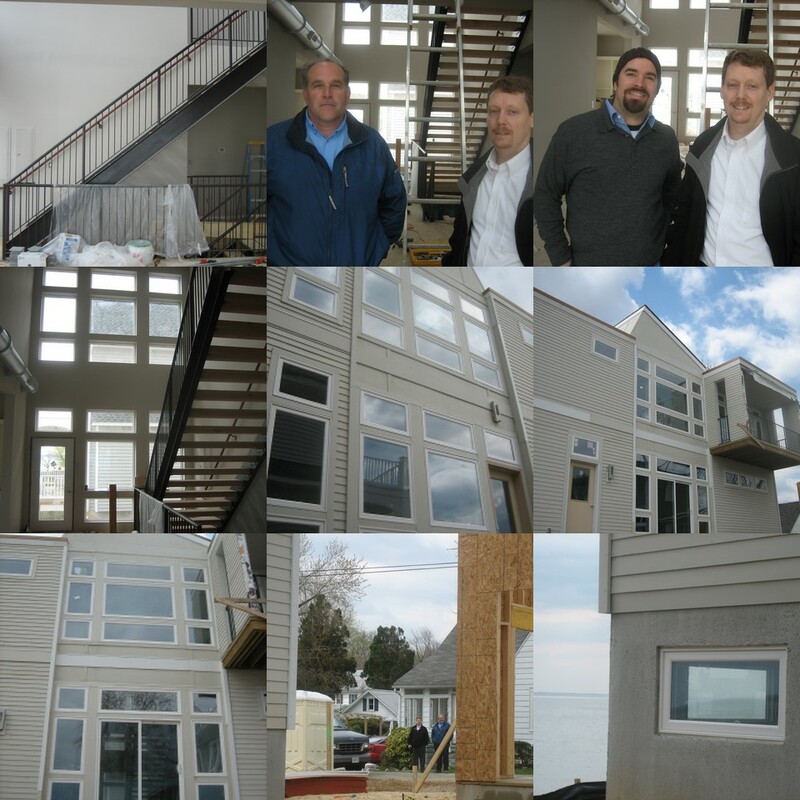 Here are some additional photos from the site visit Toby, Kevin, and I made to the Greenbelt #2 on Cheseapeake Bay on Friday, April 13th. The tile work, finish painting, and steel staircase with maple treads were being completed while we were there. Our project manager, Andrew Gullett isn't in these photos but he has been doing a great job managing the completion of this customized Greenbelt house for our clients. Prince Frederick, MD has become his home away from home. 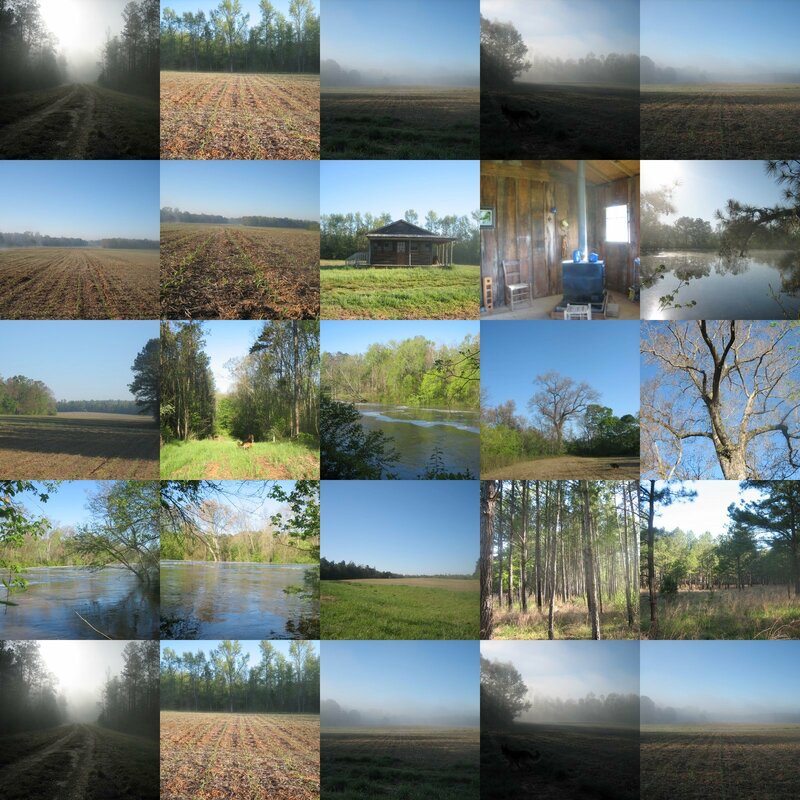 This is a collage of USA land next to our project. 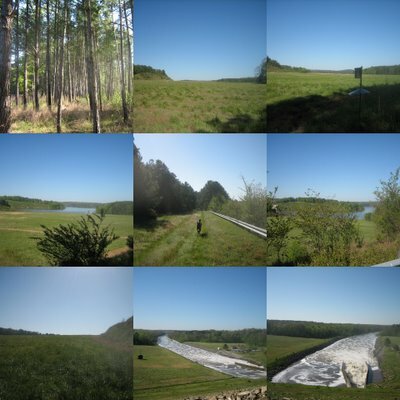 After walking through a small pine forest on the border of our 200 acre site and USA land, the land opens up into a huge meadow that leads over to Jordan Lake and Jordan Dam. 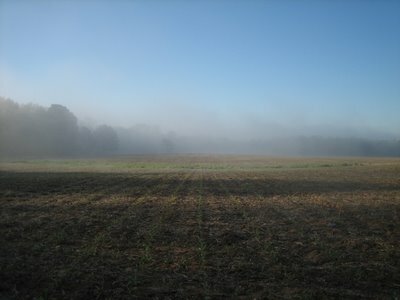 This site is only 20 minutes to Cary and 25 minutes to Raleigh and offers some amazing rural beauty. 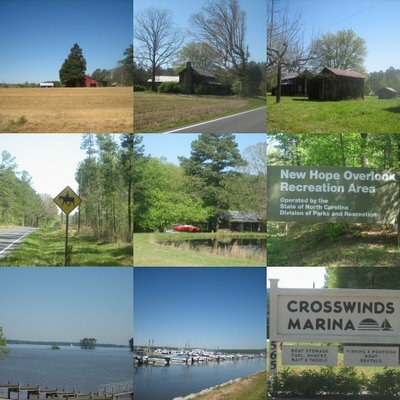 Within two miles of this site is the Overlook Boat Ramp - within 10 miles the Marina at Jordan Lake and a bunch of horse trails in between. 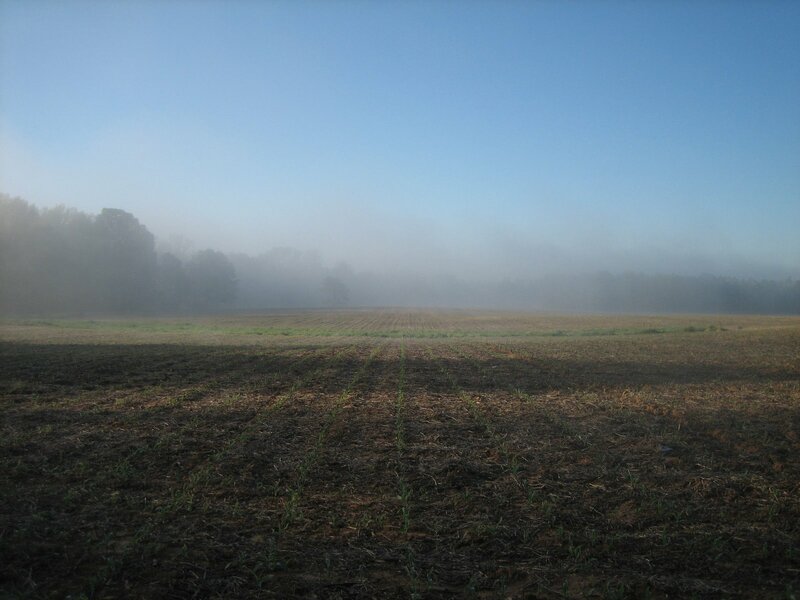 I woke up bright and early today and spent the morning exploring 200 acres of land in Chatham county that we'll be developing as one of our next major projects. After hiking the land this morning with my dog Yurka I'm even more excited about this project... We're planning a unique community that will preserve the farm and make it an amazing place to live, work, and play. The project will consist of farms, trails, and access to the adjacent Haw River and Jordan Lake. I can envision a variety of people loving this project, due to the expansive views of the land, the daily enjoyment of the farms & the water... It will be an a special place to grow up, raise kids, or retire. From the collage of photos below you'll see the morning mist on the farm, the Haw River (moving at a very good pace), an old cabin on the property, soybeans & corn in their early stages, and the pine forest that marks access to hundreds of acres of government-preserved land adjacent to the property, and an amazing oak tree next to the river. We're excited to announce a new upcoming community in the town of Chapel Hill located less than two miles from UNC campus! 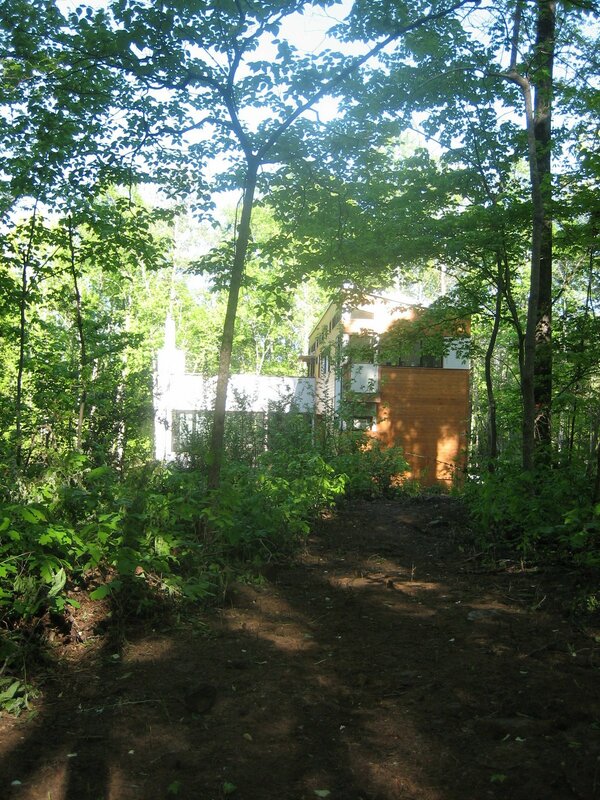 This small community consists of four one acre wooded home sites located atop a hill with great views. 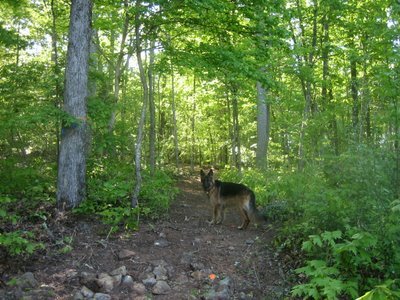 The site is adjacent to a beautiful creek and 30+ acres of preserved land that includes an open meadow great for walking your dog, jogging, or biking. 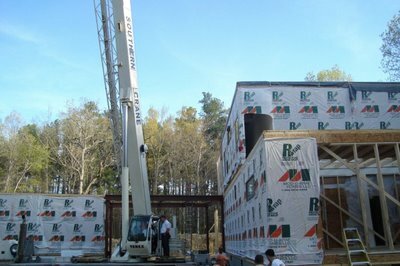 This is a rare site and is going to be an amazing place to live for those looking for the benefits of living very close to Chapel Hill! 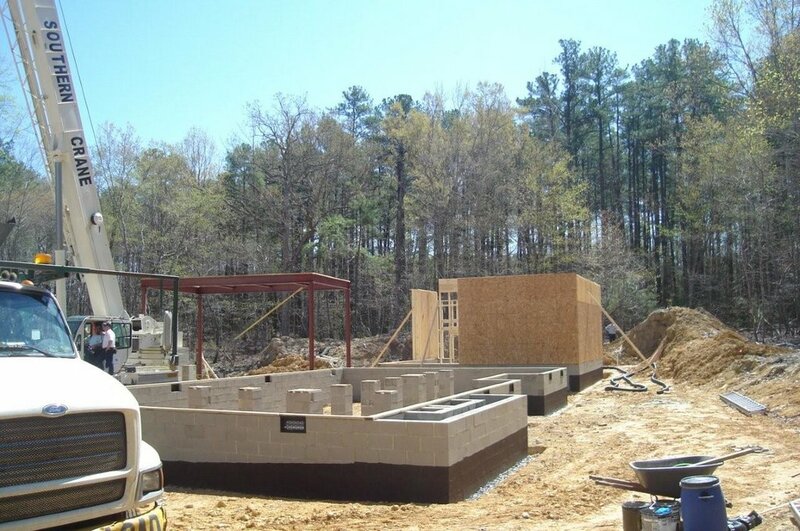 We're in the process of finalizing a detailed site plan including the landscaping plan and the home designs we'll be building on the property. The land cost is quite high since land like this in Chapel Hill (or any land in Chapel Hill actually) is very hard to find. However, four homebuyers will thoroughly enjoy living here. We envision modernist homes with amazing views, clean lines, thoughtful landscaping and gardens, and a warm response to this sensitive and beautiful site. Although I don't have all the details yet, if you think you may be interested in purchasing a site in this community feel free to give me a call directly at 919-225-6344 or email me at nathan@wieler.com. More info and images coming soon as available. 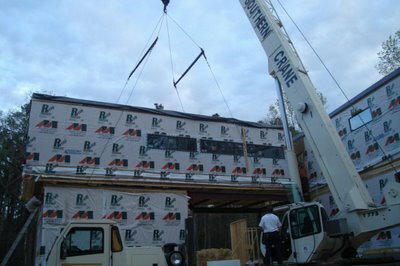 Last week we set the modules of Wieler House #4 on the foundation - a custom modern modular home located in Chapel Hill, North Carolina. We had to delay the set for a day due to rain, but as you'll see in the photos, the next day was absolutely beautiful. We went from building permit to finished foundation, framed garage (which one modules sits on), steel installed, and ready for modules in 10 days! Big congrats for Kevin, Les, Drew, Andrew, and Sam. 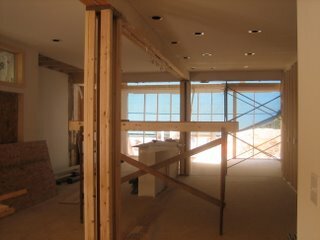 Clean interior finish - flooring will be completed on site. 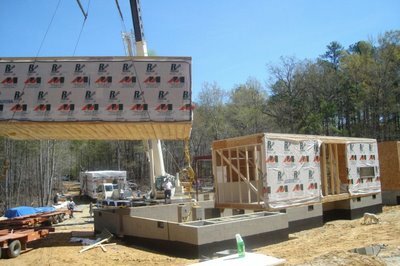 Actually, on this home, there is quite a lot more site finishing than our standard home - this is because there are a lot of different interior and exterior materials used on this project that can't be completed in the factory and/or handle the vibrations of transportation, or movement of the set. That being said, in our standard homes the majority of the fit and finish is completed in the factory and shipped to the site. 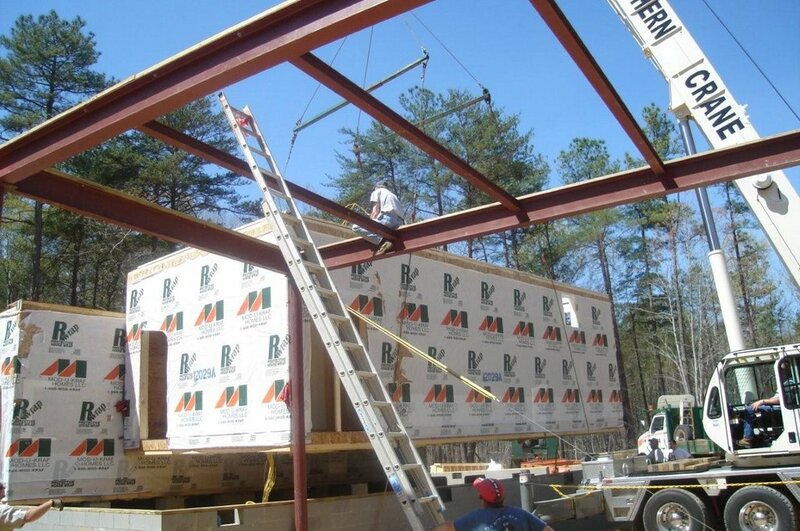 While the first Greenbelt to be constructed in the Hamptons - the Sag Harbor Greenbelt - is getting closer to completion, we're working with a client to build another Greenbelt in the area. The site is located in Montauk, New York on a hilly, wooded site that's very close to the ocean. The clients are great people and currently live in a 1950s Leisurama house on the property (as a second home). We're planning to keep their Leisurama intact and add the Greenbelt house onto it. We're excited about the combined history of the Leisurama and Greenbelt homes and plan to expand upon this later, integrating a little Montauk history... photos coming soon.